Honeywell Vista CADVDP07 video door phone is easy-to-use with user-friendly interface and minimal installation. The system is composed of an indoor monitor and a door camera. 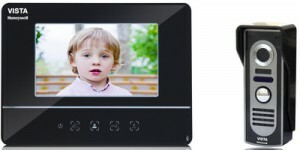 Slim and lightweight, the indoor monitor is composed of a 7″ LCD to project clear images for viewing. The door camera is equipped with LED lights and weatherproof chassis for outdoor night time or dim conditions.